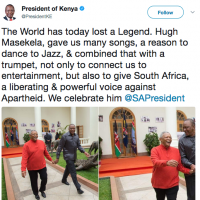 Internationally acclaimed trumpeter, flugelhornist and composer Hugh Masekela never chose to be the musical voice of a defiant South Africa. 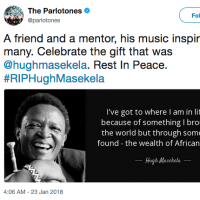 True – but Masekela is one of a handful of South African musicians to gain worldwide praise and attention. And his music has provided the soundtrack to the anti-apartheid movement. Celebrating the 20th anniversary since the start of democracy in South Africa, and performing songs from the movement, Masekela and vocalist Vusi Mahlasela (known as “The Voice” in his native country ) are collaborating on a month-long U.S. tour, “20 Years of Freedom: featuring South Africa’s Freedom Songs,” that comes to Cal Performances in Berkeley on Wednesday. Inspired by American jazz in the 1950s, Masekela began a five-decades-long career of music that protested apartheid and slavery, and portrayed hardships and hopes of an entire people. In the U.S., he had Top 40 albums and hits including the No. 1 instrumental “Grazing in the Grass” in 1968. He recorded more than 40 albums and has worked with the likes of Dizzy Gillespie, The Byrds, Fela Kuti, Marvin Gaye, Paul Simon and Stevie Wonder. Masekela moved to New York to continue his education after being forced from his homeland in 1960, when the increasingly brutal apartheid government banned public gatherings. He did not return until 1990, when Mandela and all political prisoners were freed. 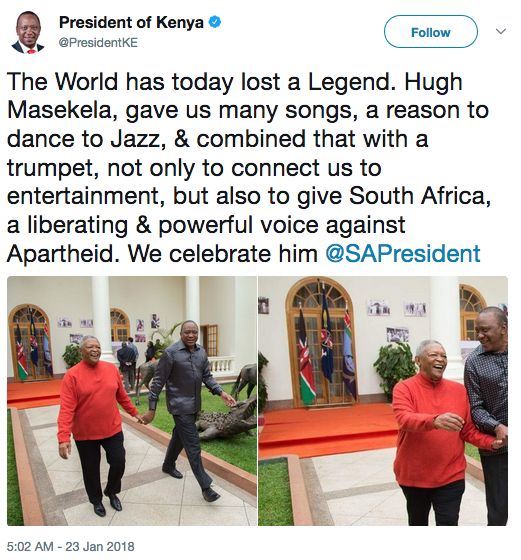 Even as Masekela’s music gave hope to millions, and his 1987 song “Bring Him Back Home (Nelson Mandela)” became a worldwide rallying cry for the release of the country’s future president, he never envisioned a South Africa free from apartheid. 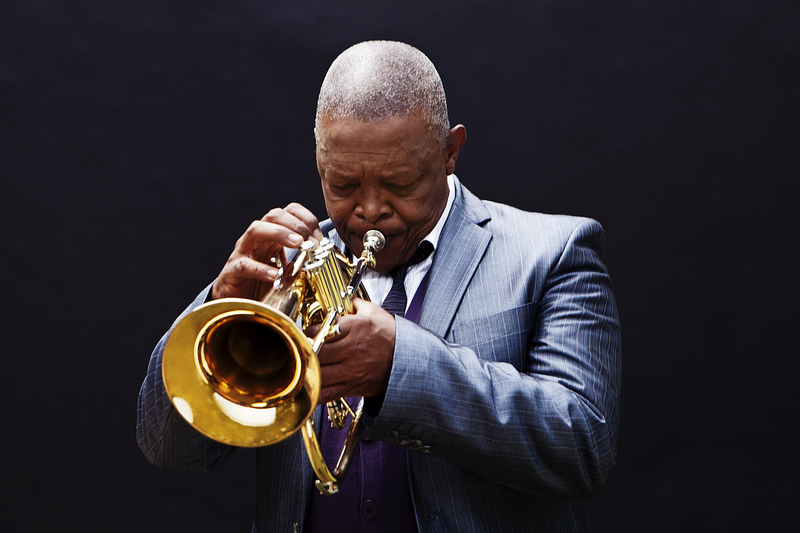 Revered South African trumpeter and flugelhorn player Hugh Masekela sets out on the road in the UK with pianist Larry Willis this November, climaxing with an appearance at the EFG London Jazz Festival. Tickets to the London show on 15 November sold out so fast that the venue was moved from the Queen Elizabeth Hall to the Royal Festival Hall. 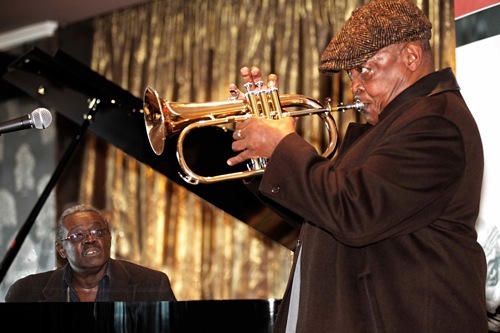 Masekela and Willis’ long friendship dates back to the 1960s when they were both studying in New York. Masekela’s playing, rich in the traditions of South African music, is tempered with the lyricism of Willis’ free-jazz and fusion piano. The concerts are based around the material of their 2012 album Friends. The tour dates are: Turner Sims, Southampton (5 Nov); St John the Evangelist Church, Oxford (10 Nov); Lakeside, Nottingham (11 Nov); RNCM, Manchester (13 Nov); St. George’s, Bristol (14 Nov); Royal Festival Hall, London (15 Nov); and Town Hall, Birmingham (16 Nov). Hugh Masekela’s trumpet becomes a mining drill in “Songs of Migration,” the tuneful, quietly stirring musical tribute running through this Saturday at the Kennedy Center’s Terrace Theater. True, the internationally renowned musician’s horn does not literally transform into a piece of machinery. But as Masekela discusses the laborers who have historically traveled from far-flung regions to toil in South Africa’s mines, he pumps his trumpet as though it were a drill chipping away at rock. When he refers to the miners’ daily descent underground, he lets the word “deep” ring out for several seconds, in an anguished, falling cry. Masekela’s salvos of showmanship are among the chief pleasures of “Songs of Migration,” conceived by Masekela with South African director James Ngcobo and written and directed by Ngcobo. Interweaving songs with snippets of storytelling, bits of stage business and a hint of dance, the production evokes the lives and musical legacy of migrant workers in late-19th-century Southern Africa. But the perspective ranges in space and time, too, encompassing a few traditional African American songs (“Rail Road,” “Hush”) and even sampling “Look to the Rainbow” (from “Finian’s Rainbow”) and “My Yiddishe Momme” for a broader meditation on diaspora and the hope, disappointment, homesickness, frustration and resilience that it unleashes. Amid such theatrical touches, the show’s two headliners take frequent moments in the spotlight. When he’s not playing his trumpet, the elderly Masekela — dressed in black, with a purple jacket — often breaks into gentle but exuberant dance, knees bent, hips shimmying, feet gliding in a delicate soft-shoe. Khumalo, looking stately in colored dresses with matching head scarves, does some mellifluous singing. But she acts and tells stories, too. In a speech that highlights the close connections between sound, emotion and memory, she reminisces about the street noises she heard growing up in Soweto, for instance. And in an amusing sequence, as the ensemble sings its way through an upbeat ditty, Masekela pretends to be a tipsy township resident getting too friendly with the ladies, and Khumalo quells him with an icy stare. Now wistful, now buoyant in tone, “Songs of Migration” brims with universal concerns: the anxiety caused by separation from friends and loved ones; the problems of unemployment and worker exploitation; the difficulty of adjusting to a new environment; loneliness. But specific references to South Africa’s past surface, too: At one point in the show, performers briefly hold up signs referring to the 1955 Freedom Charter and to the notorious Sharpeville Massacre, for instance. Theatergoers versed in the history of Masekela’s homeland might be best positioned to appreciate these references. Still, “Songs of Migration” is principally a trove of music, plus an irresistible leading man. Mining imagery notwithstanding, it’s the sound, and Masekela’s charisma, that run deep here. Hugh Masekela, Sibongile Khumalo and the multi-talented cast of the acclaimed Songs of Migration kicked off their international tour last weekend at the Royal Theatre Carre in Amsterdam. Songs of Migration is a musical tribute to the cultural contribution of late–19th century migrants from across the African continent, created by and featuring internationally acclaimed trumpeter, composer, and lyricist Hugh Masekela and written and directed by James Ngcobo. In this celebration of song and dance, the same dusty streets, settlement camps, and train cars that sometimes separated families echo with the centuries of indigenous sounds that helped hold a patchwork culture together. Songs of Migration commemorates and rejoices in the way in which the promise of gold and the search for a better life brought together a continent ‘s worth of music, traditional costumes, instruments, songs, ceremonies, and dance. Featuring songs by the likes of Joseph Shabalala, Dorothy Masuka, Miriam Makeba, Mackay Davashe, Victor Ndlazilwane, Gibson Kente and Masekela himself, among many others, this cleverly designed show is filled with raw emotion, joyful exuberance and passionate storytelling. Songs of Migration saw critical acclaim over 3 runs at the historical Market Theatre in Johannesburg, South Africa, and had audiences singing along, crying, and dancing in the aisles. Sibojama Theatre has now taken on the task of carrying this powerful piece beyond the borders of the ‘City of Gold’ and bringing a wealth of history, heritage, stories and music to audiences around the world. The tour continued this week with performances at the iconic Hackney Empire in London and will soon grace the Kennedy Center in Washington, DC and the Artscape Opera House in Cape Town. For more information on venues, dates and ticket sales go to our Tour Dates page. 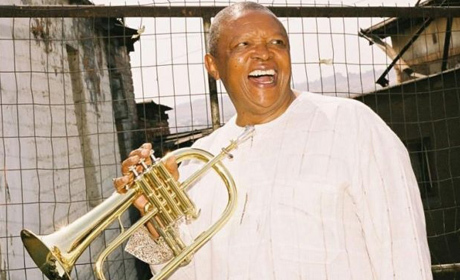 Hugh Masekela Joins Paul Simon Graceland Tour! Hugh Masekela Joins Paul Simon in London to Kick off the Graceland Tour! Twenty five years after Hugh Masekela first collaborated with Paul Simon and now legendary SA musicians like Miriam Makeba and Ladysmith Black Mambazo on the Graceland album and subsequent tour – the two icons reunited on a Hyde Park Stage on 15 July 2012. The anniversary celebration included the original Graceland band, led by guitarist Ray Phiri as well as Ladysmith Black Mambazo and reggae star, Jimmy Cliff. This celebratory concert marks the beginning of an anniversary tour that coincides with the release of a new edition of Graceland, which was recorded in Johannesburg last year and features a number of the musicians off the original album. In 1987, South Africa was in a state of emergency, Nelson Mandela was behind bars and the South African people were utterly oppressed by the apartheid government. 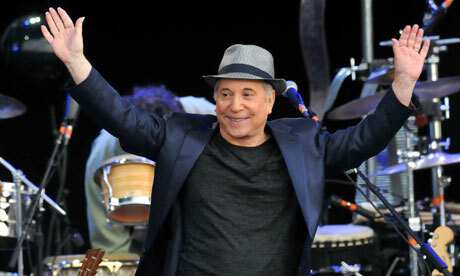 The international community established boycotts in support of the Struggle – including a cultural boycott that Paul Simon broke by recording Graceland in South Africa. 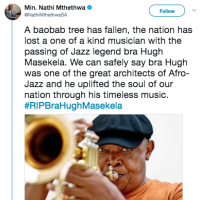 Hugh Masekela defended him against international outcry at this contravention as it was not only hugely advantageous to the careers of the South African musicians involved, but also brought a much higher level of awareness of the South African situation to the world. Twenty five years on, their anniversary tour is a joyous celebration of their longstanding friendship that is now welcomed in a democratic South Africa. Both septuagenarians show no signs of slowing down as they revel in the diverse, funky, beautiful music that brought them together. Born out of South Africa’s apartheid system, Hugh Masekela was an early entrant into the world of trumpets and drumbeats; benefiting immensely from some of the best musical experiences of the world. His first trumpet was a gift from Louis Armstrong; Harry Belafonte facilitated his flight to New York where Dizzy Gillespie and Miles Davis hosted him. When he recently sprinted onto the stage in Nairobi, Masekela, who turned 72 in April, left many wowed. “My wife and I practice the Chinese martial arts tai chi every day and I swim and laugh a lot,” he said, when asked about his vigorous 2-hour show, accompanied by a largely youthful band. Ever the entertainer, the witty trumpeter, vocalist and songwriter regaled the crowd with humorous tales in between performances. He recalled the apartheid laws in South Africa that prohibited Africans from consuming alcohol and how he grew up in a drinking den watching his grandmother play hide and seek with the police. “I didn’t turn out too badly for a boy born in a shebeen,” Masekela joked while performing Khauleza, a song originally by another South African great Dorothy Masuka. It is by hearing tales of cruelty and measly pay from migrant labourers who used to drink in his grandmother’s shebeen that he wrote the powerful protest song Stimela. The 1972 classic which begins with Masekela mimicking the steam engine that carried forced labour to Johannesburg still arouses strong passions. The swinging groove of Makoti (originally recorded by Miriam Makeba and the Skylarks in 1959), from the latest album Jabulani,is irresistible. The album, which reunites him with long-time producer Don Laka, is a collection of South African folk wedding songs inspired by the township ceremonies of yesteryear. Philip McGillicuddy was born in Liverpool and hung out with John, Paul, George, Ringo and … Mick before being washed across the seas to South Africa. The swim through all the muck gave him a certain complexion and a passing couple took pity on him, fished him out and – ach, you’ve twigged. I’m at it. Or rather, Hugh Masekela was at it, with an alternative biography. 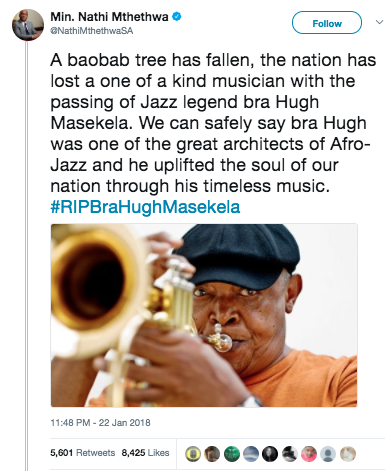 The South African flugelhorn player and cultural icon is a rascal. He does almost as much leg-pulling as music-making. But it all adds up to a party, even if some dancers were out of their seats too early for Mr M’s liking. Such keen audience participation is a tribute to the persuasiveness of Masekela’s groove because the opening numbers, coming close to smooth jazz with township-churchy melodies, were a clear indication that Masekela knows how to pace a gig. Fluctuating between skilful horn improvisations, percussion instruments, the vocal mic and a sort of personal tai chi, he has his band well drilled. When they do fire up, it’s relative, although guitarist Cameron Ward produced much appealingly stinging playing, and still geared towards making Masekela, rightly, the focus. A very youthful 71, Masekela handles the limelight with ease, getting his message across succinctly and “toot tooting” his way through Stimela, his song about the coal train that brings forced labour into South Africa, without diluting its potency. Thereafter the dancers had his blessing and the groove eased up a notch without appearing to overtax the musicians. In the 42 years since he became an international sensation through Grazing in the Grass, Hugh Masekela has played many roles, from the strictly musical to the overtly political. Here are a few of the parts he played at the end of his North American tour Saturday. A cross between Louis Armstrong and Robin Williams, Masekela manages to be simultaneously ingratiating and challenging, teasing the crowd while at the same time slipping in some very pointed commentary. For instance, after making light of how uptight some Torontonians can be — “You can tell they’ve never made noise before,” he joked, “not even in bed!” — he suggested that the next time they’re having a really good time, they think of those suffering due to natural disasters or oppressive governments. Then he sang Stimela, about the coal train that brought generations of migrant workers to toil for a pittance in the mines of Johannesburg. It was catchy, horrifying and strangely uplifting. Even the uptight were smitten. Masekela saved his political content for the last song of his first set. Prior to that, he kept the focus squarely on the music – singing (mostly in Zulu), playing flugelhorn or percussion, and even dancing as the spirit moved him. This was, after all, a show, not a rally, and Masekela made sure everybody was having a good time before getting into the serious stuff. So he kept the opening numbers light, slipped a mention of Toronto into his disco-era hit The Boy’s Doin’ It, and cut loose with a spirited mbaqanga tune before appealing to the audience’s conscience. However much Masekela was interested in making a point, he was even more eager to win the audience over. In other words, he’s more a showman than a polemicist, and that, ultimately, was what kept bringing the crowd to its feet. It helps that, at 71, he not only remains in full control of his instrument but also dances like a demon; it also can’t hurt that he’s a born comic. 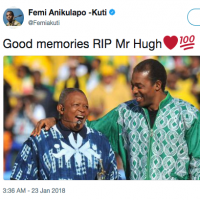 When he sang Lady, an Afrobeat classic by the Nigerian firebrand Fela Kuti, he used body language to make plain that the song was a satire, almost a burlesque, something that made the meaning clear to those who couldn’t follow the semi-English lyrics. Even Fela couldn’t twist the knife so deftly. As persuasive as he was when telling a joke or cajoling the crowd, Masekela was at his most eloquent when playing his hand-built silver flugelhorn. He’s not a flash player, emphasizing speed and high notes; like most South Africans, he’s more impressed by subtlety and wit, and his playing is full of both. In the lower register, his horn delivers the sweet, dark tone jazz fans normally associate with the flugelhorn, but in the upper reaches, his sound has the bright warmth of a cornet, so that his richly ornamented melodic lines almost shimmer against the insistence of the rhythm section. His band, meanwhile, both supports his strengths and keeps him on his toes. Cameron Ward was an able foil, matching Masekela’s half-valved vocalizations with screaming, psychedelic guitar lines, while keyboardist Randal Skippers brought the crowd to its feet with a rollicking, gospel-inflected solo at the end of Grazing in the Grass. Hugh Masekela, born out of apartheid South Africa, has consistently toured worldwide and his genre-bending dynamism has led to his own icon status. His uncategorizable sound comes to life on his October 2010 North American tour. After many years spent in exile from the violence and oppression of apartheid-era South Africa, Masekela returned 20 years ago to help rebuild his homeland. Masekela’s live performances continue to demonstrate his status as a South African musical freedom fighter. The last time I heard the trumpeter and singer Hugh Masekela was at a New Year’s Eve party in 1990 on the slopes of Table Mountain. 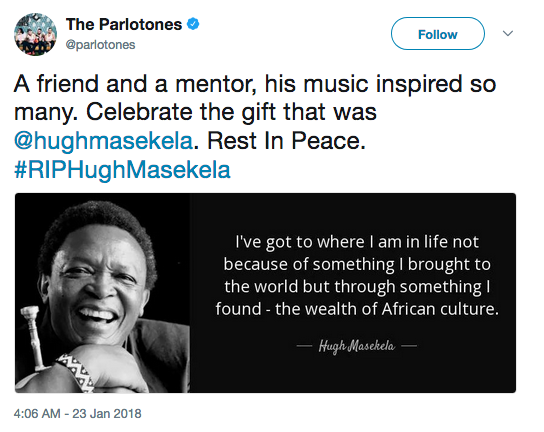 Nelson Mandela had recently been released and Masekela had returned from exile. The hot night air blew in from False Bay, and conversation crackled with nervous anticipation of the year ahead. From the windows of the Cape Dutch Menell house at Glendirk, Masekela’s mournful flugelhorn wailed across the mountainside. It was not a cry of future liberation but an echo of past sadness and oppression. It was utterly beautiful. That horn was no less beautiful on Wednesday night. At London’s Barbican the diminutive Masekela, now 68, picked up the entire London Symphony Orchestra, swirled it above his head and rammed it full of electricity. “It is not true,” he cried in delight, “that symphony orchestras can’t swing.” The concrete acres and bleak empty decks of the Barbican receded and the sandy-coloured wooden walls of the hall took on the shades of the bushveldt. From student hostels, embassies and enclaves had emerged the capital’s African diaspora. They filled the hall, shouting, clapping, singing and weeping for their hero, Masekela. As he played the great anthem Morija-Maseru, and called out the names of Lesotho, Botswana, Swaziland, Namibia and Angola, cries of ecstatic recognition broke out from the audience. However briefly, he had brought today’s exiles home. Masekela’s enterprise with the LSO was the brainchild of its remarkable director, Kathryn McDowell. She had not only to marry a jazz trumpeter to a symphony orchestra, which is no longer new, but also rearrange Masekela’s music for classical players, have them play with appropriate rhythm, and make use of the local St Luke’s community choir. Small wonder Masekela described the operation as “a hazardous trip” that had left him “scared stiff”. He struck gold in his orchestral arranger, Jason Yarde, a Rastafarian Guyanan with a remarkable talent both as saxophonist and composer. In return, Masekela performed the premiere of Yarde’s concerto for trumpet and orchestra, an uplifting piece entitled All Souls Seek Joy. Yarde is a musician to watch. In his work, “world” meets jazz meets crossover to the point where such terms mean nothing. We are left with just glorious music. Masekela, though an orthodox jazz trumpeter, embodies this phenomenon. The son of educated parents, he learned the piano at school, but when he saw a film in which Kirk Douglas played Bix Beiderbecke he knew the trumpet was for him. “Discovered” by the anti-apartheid priest Trevor Huddleston, he was given an instrument and, still in his teens, formed the first African jazz band to record an album. After Sharpeville, Masekela left South Africa and went to London’s Guildhall school of music and then to study in Manhattan, fortunate in the patronage of such musicians as Menuhin, Dankworth, Belafonte and Gillespie. 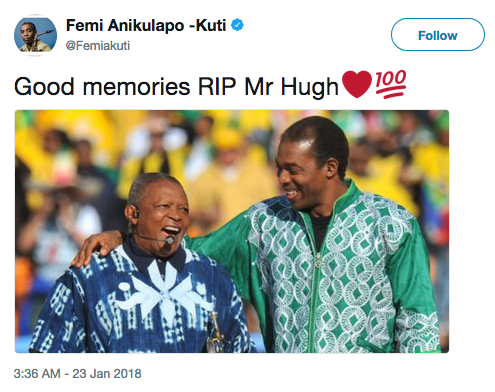 He briefly married his fellow emigre Miriam Makeba, and lived in various African countries before, on Mandela’s release in 1990, feeling able to return home. His signature piece remains Stimela, the Rock Island Line of the veldt. With a softly blown horn and a gravelly voice, Masekela tells of a steam train carrying migrant workers to the mines, the music elevated by Yarde into a crescendo of orchestral sound. Masekela dominated the stage, rendering the LSO little more than a backing group. He danced, swayed and strutted, imitating the migrants, the train driver, the conductor, the engine and even its whistle all in one. The audience rose from their seats and roared.